Internet search has come a long way in the past decade, but it does come with one flaw: local search isn’t particularly reliable for when it comes to finding local reviews. Part of this comes from where webpages are housed, and international websites are increasingly being stored on local servers around the world. These servers are called a “CDN” or “content delivery network”, and while they allow websites to appear faster based on their proximity to you, it can also come to the detriment of search. 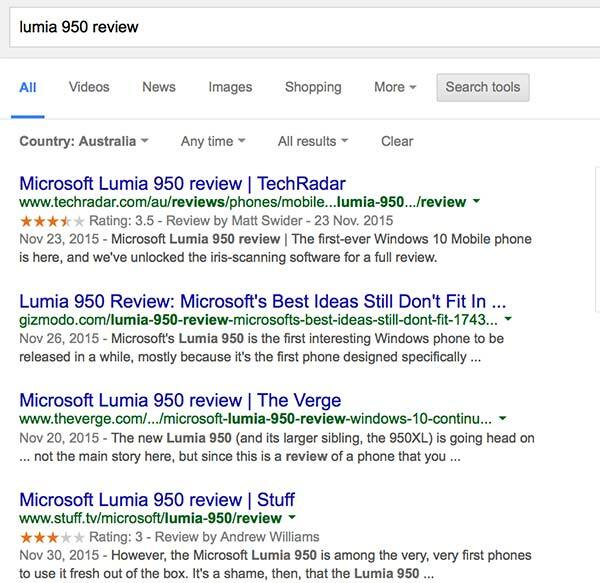 That means Google will often find an “Australian” page from an American website, and so when you look for a review of a product — even when you try to force the search to Australian websites only — you may actually be reading an American review. Ask any reviewer about differences in products and they’ll tell you that different countries get different models, with the changes ranging from something as simple to a different edition of the operation system to some severe hardware differences. Even if the product is the same exact product as seen overseas, the experience can differ dramatically due to environmental changes. For a phone, this might be the way the telecommunications network has been setup, while cameras tend to offer different video standards. There are lots of factors that make products different for each market, and while you might get the gist of a product from an international review, technology journalists and product reviewers will always suggest reading the local reviews to get the best idea of what something is like for your market. That means a phone in an American or British review may not produce the same results in Australia, and so local reviews matter. Finding them, however, can be a bit of a problem. Pickr’s tracking system (which we call the “Trackr”) has been designed to showcase the specifications of the devices you’re looking for, prefaced by the reviews written by expert reviewers local to you in Australia. We’re not forgetting about the excellent reviews from over the ocean, because they’re important too, but the first thing you’ll see on Pickr are scores and links to reviews written by excellent local reviewers, all in the same place. 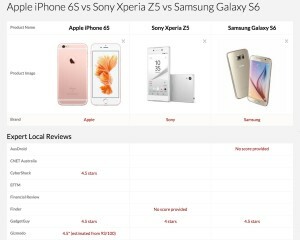 You can even compare up to three products to each other with the comparison engine, helping you to work out what to buy with star rating comparisons alongside the specs. Can’t decide between an iPhone and an Android? Stack them side by side and see what the differences are, as well as how the reviews went. In fact, Pickr has been developed by Australian reviewers to help the average Aussie make heads or tails sense of selecting a smartphone, with a middle ground option that doesn’t promote one review over the other, and lets you — the buyer — see which is best with your own comparisons. We’ve even switched over most of those spec pages into plain English, because while you can see the nitty gritty technical names if you want, we think most people will want to know if the phone supports 3G or 4G, and if there’s a removable battery. If these things matter, the information will be in an easy-to-read English. Best of all: no bias. Pickr’s tracking system sits as a middle-ground concept, and its creators see it as a tool to be used by the everyday person. Its creator would frequently get asked by people what phone they should get, and while he could tell them all sorts of things, it often came down to suggesting three options, and sending a few reviews their way. Reviews can be long, however, and while we recommend a buyer read them, quick comparisons are hard to find, especially when it involves local material. So Pickr was developed to be that middle ground, providing regular people with a comparison tool for the questions they have on consumer technology. The tracking system it houses will allow you to make those comparisons, and it even compares the reviews Pickr’s own reviewers write on products. Ultimately, this is about arming you with as much information as possible to make a decision you can be comfortable with. For now, head to the Pickr Grid where you can find every phone we currently track, with a filter to help you search by way of the telcos you can find them at.